AKG model K271 MKII are dynamic, closed-back around-ear headphones. They provide incredible sound and comfort, and they're ideal for recording and live monitoring applications. 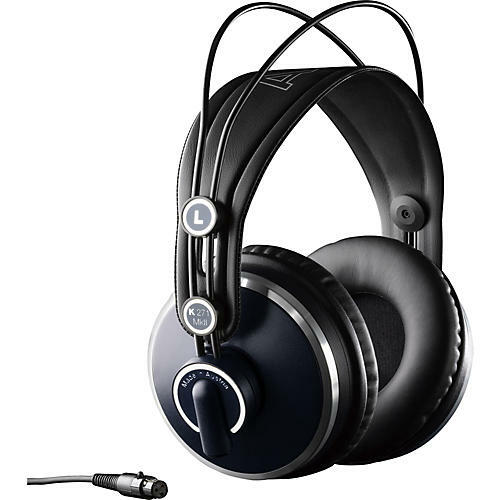 AKG K271 MKII headphones feature both leatherette and velvet earpads for great fit and maximum comfort. AKG K271 MKII headphones include a detachable 10' straight cable and a 16' coiled cable. They offer an amazingly wide frequency range from 16Hz to 28kHz, which results in better phase coherency in the audible range, giving you great sound for tracking and studio and live monitoring. The design also offers the added functionality of single-ear use. If you want efficient, dynamic listening, you'll appreciate the great sound you get from AKG K271 MKII Headphones.